It's perfect for so many occassions and uses! with only 3 ingredients (ok 4 really) it is quick and easy, yet it is so versatile! It's perfect by itself in individual dishes topped with whipped cream, or used as frosting on cupcakes or pumpkin muffins, layered into a trifle with gingersnaps and whipped cream is simply divine!!! 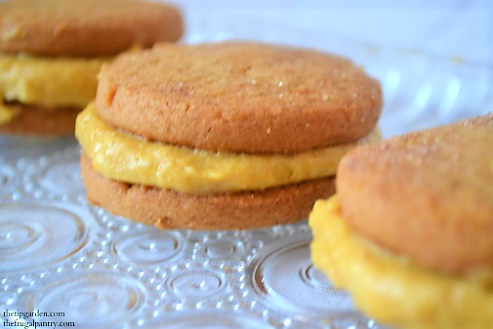 OR.. try it as a filling for quick snickerdoodle, mollasses, or gingersnap whoopie pies! And guess what??? You can make this sugar free too! 1 tsp. pumpkin pie spice. In mixing bowl combine pumpkin with thawed whip topping, mixing gently. Add in powdered pudding mix and pumpkin pie spice. Gently mix till well blended. Store in refrigerator till ready to use. Store your premade desserts in the fridge if you make them ahead of time.